My earliest recollections are of Grandmother Daniel, who by this time was widowed and lived with her daughter, my Aunt Elsie, who lived at 27 Roslyn Terrace, Devonport. I remember my grand-mother well, she was a find old lady and died when I would be about 12 or 13 years old. At one stage Grandma Daniel, who was getting on in years, was becoming a bit of a problem for Aunt Elsie to cope with. She was trying to keep her home together and was a bit dependent on having to let rooms to make ends meet. She and Uncle Bert were instrumental in putting Grandma Daniel in the Costley Home, which upset my father to such a degree he never spoke to or mentioned his brother or sister again. The argument was paltry, but what upset him was the fact that Aunt Elsie used to pocket or use the few miserable shillings he contributed to his mother’s welfare on a regular basis. It’s a peculiar fact that nine out of ten family rows emanate through money dealings. Letting money transactions rear their ugly head in family decisions is a sure way to disharmony. The Costley Home for the Aged Poor was founded by the ladies of Auckland, led on in the matter chiefly by Mrs Philson. They carried on this humane work for a number of years prior to 1883, when the Government handed over the charitable institutions to the care of the people of Auckland, and the Home then came under the control of a committee of management, which in turn was superseded by the Hospital and Charitable Aid Board in 1885. 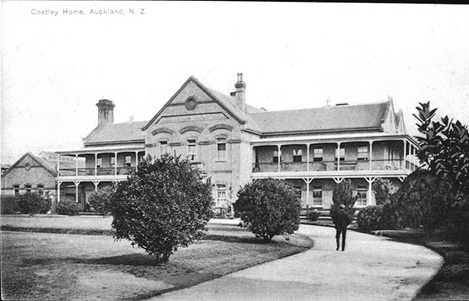 The first Home was an old wooden building in the Hospital enclosure, originally erected and used as the Lunatic Asylum. In 1890 the inmates were removed to a new building at Epsom, erected entirely out of funds provided by the late Mr. Edward Costley. Costley House – 1910-1919 – Sire george Grey Collections.